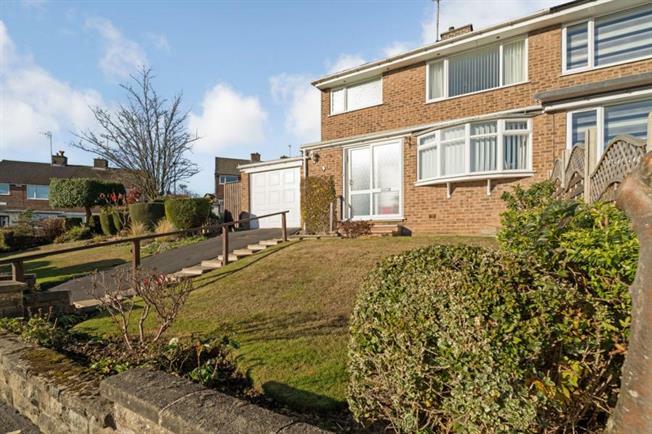 3 Bedroom Semi Detached House For Sale in Sheffield for Guide Price £285,000. A most desirable, three bedroom semi detached family home, offering well proportioned accommodation for the family, set in a delightful position on a corner plot which is situated in this highly sought after location within a short walk of Fulwood Village and its wide range of amenities. The property itself has gas central heating, double glazing and a garage with driveway providing off road parking. Number 9 Hallamshire Road offers further potential for those looking to create a lovely family home to their own taste/requirements (subject to consents). The accommodation in brief comprises: Entrance porch, hallway, lounge with front facing bow window open plan through to the dining Room which has rear facing patio style doors accessing the rear garden. The breakfast Kitchen has a range of wall and base units with integrated appliances to include electric hob, oven, extractor fan and dishwasher, along with space and plumbing for an automatic washing machine. Pantry and door to the rear. First floor: Three Bedrooms, two of which are double rooms, with the master bedroom having built in wardrobes to one wall and single bedroom three, family bathroom/W.C. with mains shower. Externally: Well stocked front garden. Driveway to Attached Garage. Beautiful, side and rear gardens being mainly laid to lawn with stocked borders, flagged patio and garden shed to the rear. This is an extremely sought after location, on the south westerly fringe of the city, close to beautiful countryside, in the catchment area for good schools and with a frequent bus service on Crimicar Lane, giving access to the University, hospitals and city centre. Well placed for the City Centre some four miles away, excellent school catchment and on the doorstep of The Mayfield Valley and Peak National Park.